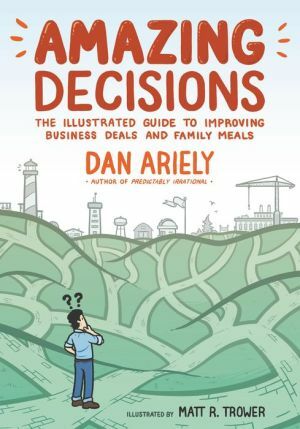 Dan Ariely, the New York Times bestselling author of Predictably Irrational, and illustrator Matt R. Trower present a playful graphic novel guide to better decision-making, based on the author’s groundbreaking research in behavioral economics, neuroscience, and psychology. The internationally renowned author Dan Ariely is known for his incisive investigations into the messy business of decision-making. Now, in Amazing Decisions, his unique perspective―informed by behavioral economics, neuroscience, and psychology―comes alive in the graphic form. The illustrator Matt R. Trower’s playful and expressive artwork captures the lessons of Ariely’s groundbreaking research as they explore the essential question: How can we make better decisions? Amazing Decisions follows the narrator, Adam, as he faces the daily barrage of choices and deliberations. He juggles two overlapping―and often contradictory―sets of norms: social norms and market norms. These norms inform our thinking in ways we often don’t notice, just as Adam is shadowed by the “market fairy” and the “social fairy,” each compelling him to act in certain ways. Good decision-making, Ariely argues, requires us to identify and evaluate the forces at play under different circumstances, leading to an optimal outcome. Amazing Decisions is a fascinating and entertaining guide to developing skills that will prove invaluable in personal and professional life.